This .300 AAC Blackout ammunition from Team Never Quit delivers dependable, quiet performance. Each cartridge in this box of 20 fires a heavy 220 grain boat tailed hollow point bullet at a subsonic muzzle velocity. This is ideal for suppressed firearms, as it prevents the "sonic crack" associated with supersonic ammunition and enables the suppressor to heavily dampen the muzzle report. TNQ (Team Never Quit) ammo is made in the USA and uses non-corrosive Boxer primers and Jagemann brass cases. 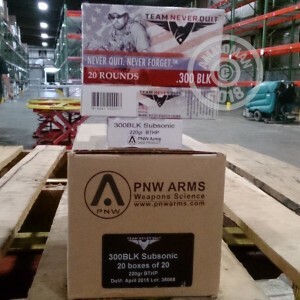 It was developed by PNW Arms, Snake River Shooting Products, and decorated Navy SEAL veteran Marcus Luttrell, who engaged in extensive personal testing of the ammo. Save on all the ammo you can shoot at AmmoMan.com, where all orders over $99 come with free shipping!